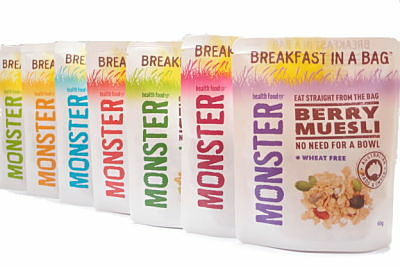 Monster Health Food Company,an Australian made and family owned breakfast food brand, has today launched a new addition to their already extensive list of muesli products, Breakfast In A Bag. The pre-packaged breakfast bags come in 60-gram single servings, allowing for milk or yoghurt to be poured into package, addressing a nation-wide need for breakfast offerings that are easy to eat, portioned controlled and off the shelf. Monster Health Food Company has identified a gap in a market where people are time-poor and are seeking a breakfast cereal that is convenient, tasty and healthy. “The concept of breakfast on the go is certainly not a new concept in the Australian market,” says Kim Lauman, one half of the husband-and-wife team and owners of Monster Health Food Company. “The gap in the market was healthy, calorie controlled, easy to eat on the go breakfast that still tastes good – we have filled that gap and are extremely proud of that fact”. With 20 years’ experience in the industry, including a loyal following for their well known gluten-free and nut-free varieties, the muesli-producing brand has overcome the challenge of delivering a healthy and nutritious single-serve breakfast with great taste.The secret behind their success is partly because of their drying method. Monster Health Food Company carries an extensive range, and are specialists in a range of ‘free from’products, with gluten, dairy, soy, nut, preservative and wheat-free alternatives available, as well as being Halal and Kosher certified. Contains pear. Gluten free, Wheat free, Dairy free, Soy free, Nut free, Preservative free and 97% Fat Free. Also Available in 500g bags. Contains cranberries, blueberries and strawberries. Gluten free, nut free, wheat free, dairy free, soy free, preservative freeand 97% fat free. Also available in 500g bags. Contains freeze-dried blueberries, strawberries & cranberries. Nut free, wheat free, dairy free, soy free, preservative free and 92% fat free. Also available in 600g bags. Contains quinoa and papaya. Nut free. Also available in 700g bags. More than 24% fruit and nuts. Low in salt. Also available in 700g bags. Contains mango, macadamia, coconut, banana and pawpaw. Dairy free and 91% fat free. Also available in 700gbags. Low GI, 40% less fat, 6 wholegrains and nut free. Also available in 700g bags. Breakfast In A Bag varieties range between $1.79 and $3 per bag. With 2000 store locations Australia-wide, the Monster Health Food Co. range is available from Woolworths, Coles, Harris Farm Markets, Independents, and online at www.mhfco.com.au.